ABS-CBN will deliver the widest, most comprehensive coverage of President Benigno Aquino III’s fifth State of the Nation Address (SONA) on Monday (July 28) with live, up-to-date reports on all platforms, including television, radio, cable TV, and online. ABS-CBN News’s coverage will kick off in “Umagang Kay Ganda” to monitor major developments at the Senate, House of Representatives, and Batasan and will continue throughout the day, beefed up by expert analysis from guest political analysts. “Ulat sa Bayan: The State of the Nation Address 2014” will be anchored by Julius Babao for ABS-CBN beginning 3:20 PM, Tina-Monzon Palma for ANC at 3 PM, and Alvin Elchico for DZMM at 1 PM and Anthony Taberna and Gerry Baja at 3PM. Veteran political journalists Lynda Jumilla, Tony Valasquez, and Karmina Constantino will provide significant updates live from the Batasan. The live, uninterrupted coverage will also be livestreamed on ABS-CBNNews.com, which also features an Aquino Promises Tracker that shows and weighs in on President Aquino’s promises on pressing issues. Netizens can also visit the site to rate the president’s performance for the last four years and vote for their favorite outfit in this year’s SONA. Tune in to ABS-CBN’s “Ulat sa Bayan: The State of the Nation Address 2014” this Monday (July 28) on ABS-CBN Channel 2, ANC (SkyCable Channel 27), DZMM TeleRadyo (SkyCable Channel 26), DZMM Radyo Patrol Sais Trenta, or visit ABS-CBNNews.com, anc.yahoo.com, and dzmm.com.ph. 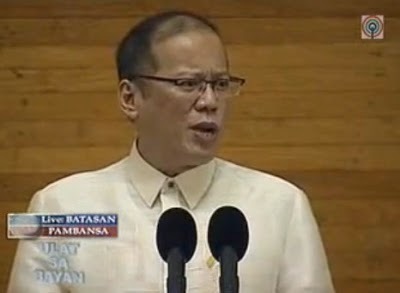 Tweet your thoughts on the SONA by using the hashtag #SONA2014 and view the Aquino Promises Tracker on ABS-CBNNews.com/aquinopromises.